I wonder what percentage of the USA population has driven Beartooth Highway: I've helped make up for them--I suspect I've driven it a dozen times at least over the decades, and never has it been more gorgeous than this past week--my camera battery gave out before we got to this spot, but fortunately, one of my eight companions (all members of the Rocky Mountain Chapter of the North American Rock Garden Society) were along--with THEIR cameras! And the President of our chapter got this picture of the actual bear tooth that the pass is named for: wonder if anyone has climbed it? On the way to the Beartooth from Cody one must cross over "Dead Indian Pass"--surely one of the least P.C. place names around. Wonder when there will be a campaign to change that one? 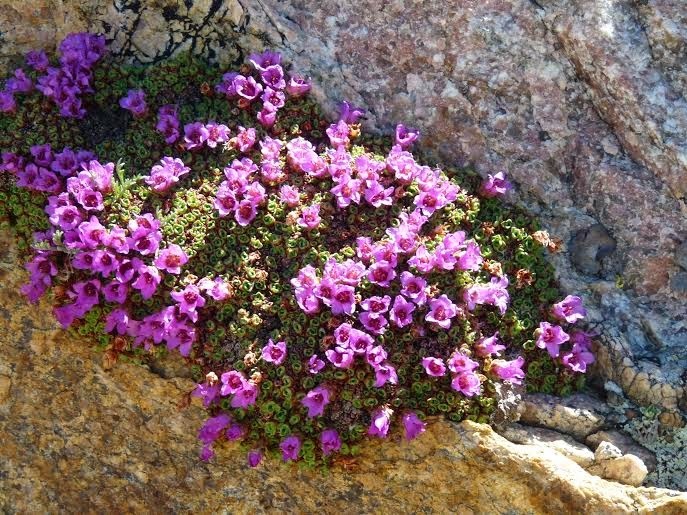 The pass is carpeted with floral gems, a blend of alpine cushion plants that descend, and montane and steppe plants climbing to their altitudinal limit. This penstemon was already in ripening seed around Cody, but here in full bloom at the heights. Tons of Locoweed--don't leave your horses here untended! Wonderful little drifts everywhere--like locoweed and a bladderpod on a scree. The dotted saxifrage is universal in the Rockies, but always a welcome sight. I wish it were as amenable to gardens as other saxifrages! Some botanists have lumped our wonderful dwarf, herbaceous clematis with the huskier climbing sort--surely lumping gone mad! I'd not found this on previous visits to the mountain--this was an especially lovely color form. Closeup of the flowers. I know...another white rosaceous blob. But I like white rosaceous blobs! I was surprised to see a rather bright pink form of the normally ivory (even dingy ivory) dusty deustus, as my ex- used to call it. We actually had some pretty good times. I will not mention just how long Allan and I have known one another: let's just say one hand is not enough to count the decades. Despite the duration, I never quite have enough of my relative, friend, mentor and buddy: what a joy to have him and Michiko along on the trip! Pilot Mountain--looking absurdly like the Matterhorn--is photobombing behind. Wyoming is really glorious! As I gazed at these I rued the troughs that used to be in Wildflower Treasures: one was always filled with this fabulous daisy (that self sowed around it). When I came back from this trip I found that the redoubtable Kintgen had several blooming in a new trough in the Rock Alpine Garden--he's always a step ahead! I am embarrassed that I do not know this spectacular potentilla--with moonlight yellow flowers. It is hard to explain the majesty of mountains to those who don't already love them. But views like this help! These were growing around the bend from that view. Arguably the most dazzling of penstemons. It is SO unfair that true forget-me-nots are so rare in Colorado (I've only seen them once) and so common in Wyoming. Is there no justice? The Dutch are selling a form of this more amenable to cultivation: yellowbells are nonetheless widespread and abundant across much of the northern Rockies and far West. One of the many links with Central Asia, I've seen this same species in the Tian Shan mountains. I, for one, can never have enough drabas! Cushions and mats all over the place...I like the way the flowering on phlox starts at one side of the mound. The Sky pilot just starting to bloom: this clump will dazzle in a week. One of the peculiar disjuncts found in the Northern Rockies and the Alps. Intriguing color blend of yellow and brown. 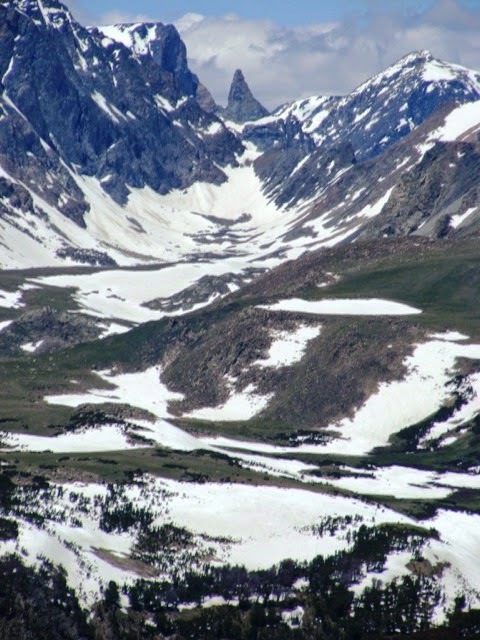 Lots of snow on the peaks and along the highway--it will be colorful all summer! I am sure there must be SOMEWHERE in Colorado where a bird has planted this. How a plant can be so common in Wyoming (not just on tundra--I've seen this below on the steppes around Sheridan) and totally absent from my native state--just not fair. But it does grow in gardens here! My picture was fuzzy of this loveliest of native saxifrages--which is found on the Beartooth, the Windrivers and elsewhere in Wyoming (and everywhere northward in the northern Rockies, Alaska, Central Asia...but not Colorado. There just be a few colonies lurking undiscovered yet...let's go look for them! Meanwhile, we can drive north seven hours to Cody and they'll be close by! Another amazing post. I have been to the Beartooths, but it has been too long. The Potentilla looks like P. diversifolia v. diversifolia to my untrained eye. They are common in timberline meadows there. Wonderful pictures invoking memories of our trip over the Beartooths years ago (with not a great camera, unfortunately). That is a super color form of Penstemon eriantherus which I grew from seed years ago. It was fairly pale, not like this one. Nice to see the various color forms of Phlox pulvinata. I so want to see the Beartooth again! It's been over forty years and I am pleased to see it looks as pristine as ever. The other interesting thing about this post is to see how many genera there are in common with the "sub-alpine" plants of the southern California mountains with which I am familiar -- phacelia, penstemon, pedicularis, potentilla, draba and fritillaria -- and how the differing species have adapted. Regarding the bunnery cryptantha, though, I would have never guessed, the form is so very different than ours. Thank you for these beautiful posts of beautiful countryside. Perhaps Potentilla arguta (Drymocallis arguta) for the mystery Potentilla...pinnate leaves, cream-colored flowers, and erect habit. Thanks, Prairiebotanist, for the ID--matches up well, although the range map doesn't quite extend to Park County (probably an oversight). I shall seek this one out for my garden! And I appreciate the many kind comments: I agree, Jane, that the West has an amazing consistency of genera--the species varying dramatically from site to site: and yet how few gardens we see composed of buckwheats, penstemons, fleabanes and the other dominant plants of our landscape? I was hoping you could fill me in on the cultural requirements of Polemonium viscosum. I had over a half dozen that were growing well from seed you had given me. Thank you again for the seed. I also had over a half dozen Telesonix heucheriformis. This past weekend something happened to them and I lost about half of them. I'm not sure if I'll be able to save the remaining plants. The leaves died for no apparent reason. At first I thought it was the heat. It's been in the mid to upper 80's. However, it has been hotter and the plants have been fine. It may be the combination of the warm temperatures and humidity. The plants are under my patio table where they receive shade except for early in the morning and later in the evening. The potting mix never dried out. I am going to bring them in to my home to see if the air conditioning helps them perk up. I usually put most of my house plants out for the summer. These will be the only plants I may actually have to bring into the house the for summer. I do not find either the Polemoniums nor Telesonix to be very difficult here: I have had some of the latter 15 years or more in a trough, although polemoniums don't last quite that long. Planting in a trough seems to really help--and having it elevated. Mid day shade is good. These are two of the easier alpines in my experience--not much harder than a draba. Can't help this time, James! Maybe the problem is they were splashed with dirty water during a recent heavy rain. That seems to be the only kind of rain we have been getting lately. Although the plants were protected from the rain by being under the table, the leaves still got dirty from water splashing in from the edges. The concrete was dirty because I had been cleaning gravel. Maybe the dirt had some pathogen that attacked the plants. Wonderful place - I gotta see that. The Potentilla looks to me like P. arguta, which grows in the montane zone here in Southern interior BC (and surrounds my garden with Penstemon procerus and Solidago multiradiata). Eflora BC's distribution map does show it in Wyoming. Lovely! Thanks for the tour. Who says arid and "boring" isn't stunning?